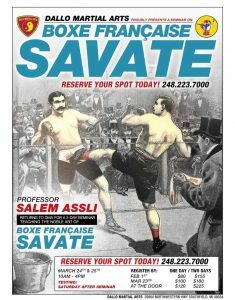 Professor Salem returns to DMA to host our annual 2-day French Boxing seminar. We will explore Boxe Française Savate and weaponry including La Canne. TESTING for Glove rank will be Saturday immediately after 4pm. Please join us for a spectacular weekend of training! Boxe Française Savate and weaponry including La Canne. TESTING for Glove rank will be Saturday immediately after 4pm.